On a lightly floured surface, roll both pie crusts to smooth out any imperfections. Cut off rounded edges to create a 9x9 square, reserve scraps. Cut both squares into six 3x4.5-inch rectangles. Roll remaining scraps into a ball, roll to original thickness and cut into four 3x4.5-inch rectangles; you should have 16 rectangles. Lay rectangles out on a parchment-lined baking pan. Brush with beaten egg. In a small bowl, combine brown sugar and 1 teaspoon cinnamon. 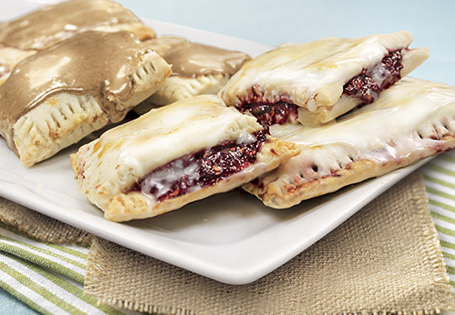 Place 2 tablespoons of brown sugar mixture in the middle of 4 rectangles and 1 heaping tablespoon raspberry preserves in another 4 rectangles, leave a ¼-inch border around edges. Take the remaining 8 rectangles and place egg side down on top of the filled rectangles. Seal the edges with fingertip and crimp edges using the tines of a fork. Refrigerate 10 minutes. Remove from refrigerator. Using a toothpick, prick the top of each tart 6-8 times, brush the tops with remaining beaten egg and bake for 7 minutes. Rotate pan, bake for additional 8 minutes. Remove from oven. In a small bowl, thoroughly mix powdered sugar, milk and vanilla. Top raspberry tarts with half of the plain icing and quickly add sprinkles. Add remaining ½ teaspoon cinnamon to icing and top brown sugar tarts. The icing will harden quickly. TIP: Refrigerate up to one week in a sealed container. Pop in a toaster oven for 1 minute to reheat.